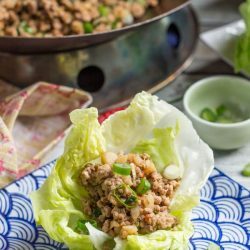 Why go out when you can whip up this super tasty san choy bow recipe (Chinese lettuce cups) at home in under 30 minutes. Wrap the filling in crunchy lettuce leaves, or simply toss the mixture with noodles for a really easy main meal. Mix the garlic, ginger and chilli together. I usually do this just on the chopping board. Mix the oyster sauce, soy sauce and toasted sesame oil together in a small bowl, and set aside. Heat a small amount of oil in a wok (or large fry pan) over a high heat. Add a third of the garlic mixture, and a third of the mince, to the wok. Cook the meat, stirring frequently to avoid it catching on the bottom of the wok, for 3 minutes or until the meat is just cooked. Remove the meat from the wok and set aside. Cook the remaining meat, using the same method, in two batches. Place the chopped mushrooms and spring onions in the empty wok, and stir fry over high heat for 2 minutes until softened. Add a little more oil if necessary to stop the vegetables sticking. Add the beans and chopped water chestnuts, and fry for a further 1 minute. Add the meat and any juices back to the wok. Pour in the oyster sauce mixture. Toss the meat and vegetables together for a minute, until everything is well coated in sauce and heated through. Serve in a large bowl accompanied by the lettuce leaves. If served as an appetiser, this recipe will be enough for 4 people, assuming it is to be accompanied by other dishes. If tossed through softened udon or egg noodles, this recipe will serve 4 as a main meal (assuming you add loads of noodles). # Omit the lettuce leaves if you are serving this as a main meal with rice or noodles. Nutritional information is supplied for the filling without lettuce cups or noodles.